NICE MyCar launched at London Motor Show July 2008. £8,995 starting price. Italian styling. Storage space under the bonnet, storage space in boot. Options including removable roof and work n play / drive n play packages. No CO2 emissions which means no road tax. MyCar will also be congestion charge exempt and parking concessions are available in many London boroughs1 and in other parts of the UK. More on-street charging points will further increase its appeal. 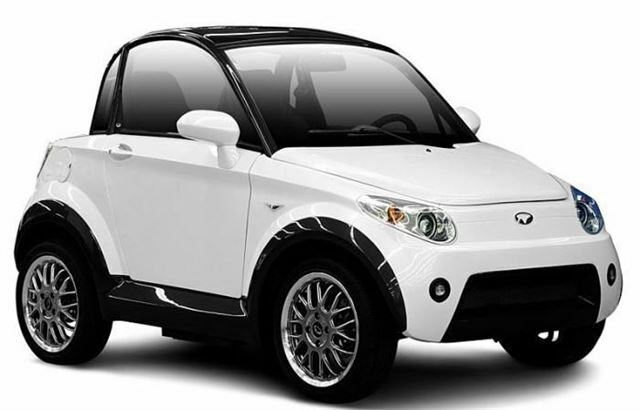 Standard equipment for MyCar includes electric windows and mirrors, Radio/MP3 player, 14” Alloy wheels, remote central locking, Hi/lo and boost button and LCD multifunction display. It also has storage space under the bonnet, in the boot and in the glove compartment. Options include a glass roof or removable fiberglass version. MyCar can also be specified with 15” Alloy wheels, leather interior, cooled and heated seats and a boot rack. All option prices are to be confirmed. Two innovative features are work ‘n’ play and drive ‘n’ play options. The first incorporates a forward-folding passenger seat complete with laptop dock, the latter includes bluetooth, sat-nav and upgraded audio. MyCar is made of fibreglass reinforced plastic on a steel tubular spaceframe with tubular roll-bar. It has disc brakes and independent front and rear suspension.